H.H. Dorje Chang Buddha III Wan Ko Yeshe Norbu Holiest Tathagata possesses consummate mastery in molding with His hands the myriad beings and things of this world, both sentient and non-sentient. Such works of art include mountains, rivers, land formations, and other natural scenes. We have included in this chapter only some of His Holiness’s hand-sculpted scenes as an expression of the dharma. The hand-molded artwork of H.H. Dorje Chang Buddha III looks as genuine as real natural scenes. Although these mountains, rivers, and scenery were created in a room, they appear no different from natural landscapes. Broad artistic concepts underlie their design, and they have a majestic quality to them. Nobody in human history has been able to create such works. Those who personally view the hand-molded artwork of H.H. 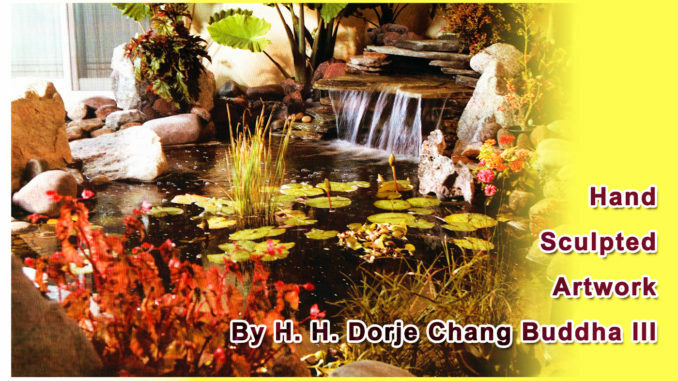 Dorje Chang Buddha III behold the elegance of natural-looking scenes more beautiful than the creations of nature itself.